The curtains open. Dressed in a bowtie and tux, you emerge from the shadows, holding your gleaming violin at the ready. As soon as your bow touches the instrument, coaxing soul-stirring music springs from the violin’s strings. You know that you’ve touched greatness. Until suddenly, you look beyond the stage and see rows and rows of seats… all empty. In business, as in music, no audience means no show. A successful company is one that know its audience, understands their needs, and motivates them to take action. Thus far, in this series we have discussed marketing secrets that – no matter how unlikely it may seem – are as old as the marketing field itself. But no marketing technique is more crucial than that knowing the demands and desires of your audience, and crafting your products and your message for them. Marketing should always begin by discovering as much as possible about your target market. Are they young and adventurous? Stressed and overwhelmed? Rugged and tough? Are they looking for luxury? Convenience? Fun? Camaraderie? Nowadays our ads may seem different, but it’s the same concept at work… climbing into the mind of your target market and using images and ideas they relate to (filthy towels = bad; cute kids = good). Yes, that’s right. 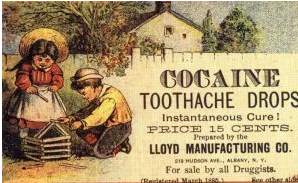 Cocaine was actually sold as a cure for childhood toothaches. But take a closer look at the illustration. There’s a young boy and girl wearing adorable hats, playing happily together. Don’t miss the white picket fence in the background. In those days, that was about as aspirational as you could get. Adults weren’t immune to aspirational marketing either. 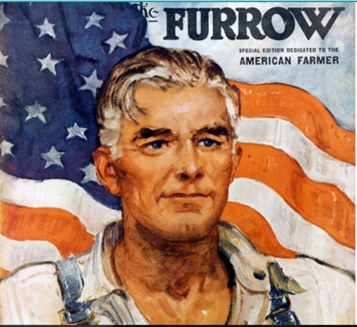 On the cover of Furrow (the John Deere magazine we mentioned in Part 2), a man stands tall and strong with an American flag unfurled in the background. His rugged clothes and tanned skin mark him as a farmer – the farmer that Furrow’s readers would have aspired to become. Nowadays, aspirational marketing may look different, but it draws on the same basic concept. Take a look at this commercial. It paints a picture of the “perfect life” that car owners could easily have, just by virtue of the fact that they own a Prius. Of course, modern companies do this all the time with logos like Nike (the swoosh) or McDonald’s (the Golden Arches). But this goes much deeper than logos. Modern products also show off unique design features to convey the subtle message, we are something special. You’d be surprised how many of these trademark designs the average person can easily recognize. To illustrate, challenge yourself with this quick quiz on design marks. Look at these three consumer items. Can you name which company makes each of them? Now look at these three items of apparel. 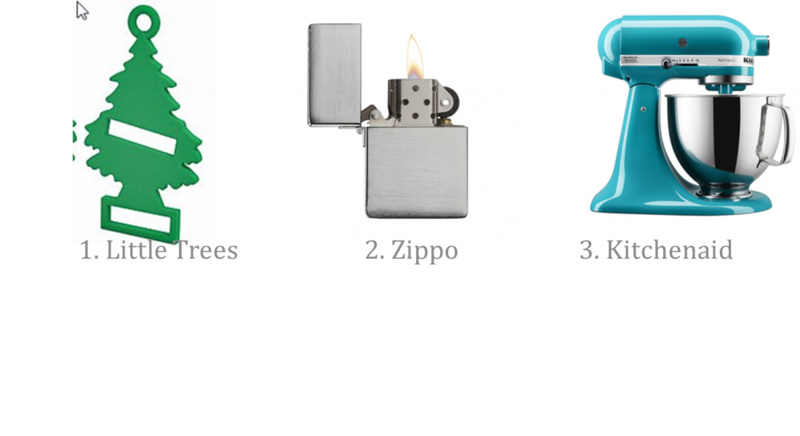 Can you name the company that makes each of them? Take a look at the plaid scarf above. While a typical well-made scarf might go for under $50, this name-brand scarf can easily run you several hundred. The difference? While it may seem to have something to do with the fact that the company does, in fact, create scarves that are extremely soft and durable, that alone wouldn’t command a super-premium price. And then there are the shoes. Why does the company above slip an easily recognizable red stripe down the back or front of each shoe? So that you can broadcast to the world that you aren’t just someone… you’re someone who wears Prada shoes. To be sure, brandmarks and design marks are related to aspirational marketing, but they can be very subtle. If you use this product, you can show the world that you’ve achieved your aspirations. So while branding has evolved over the years, it stems from the same basic idea that drove Dairy Queen to rave about their marvelous ice cream curl. What does that mean for us? It’s time for marketers to recognize that today’s cutting-edge techniques have long and fascinating histories. Rather than patting ourselves on the back for outshining those who came before us, it’s time for us to learn from marketers of the past in our search for new ways to connect with audiences and propel our industry into the future. This is the final article in a series that explores how modern businesses can learn marketing secrets by examining advertisements of the past. This post focuses on the marketing history of using targeted marketing, aspirational marketing, and trademarks in order to reach a given audience. See all the articles in the series here.